This article is going to tell how to fix low disk space problem on Windows Server 2008, SBS 2008 and Windows Server 2008 R2. Download IM-Magic Partition Resizer Server to redistribute hard disk when disk partition is running on low disk space on Server 2008. You may receive low disk space alert message on system partition in Windows 2008. Or you may find that the data partition is running on very low disk space and cannot afford to store more data. In this situation, what can you to fix the low disk space problem? Generally speaking, you can resize hard disk by using a partition tool. IM-Magic Partition Resizer Server is designed for Windows Server users to resize hard disk without repartitioning, so you can use this partition software to reallocate disk space on Windows Server 2008 hard disk when there is low disk space problem on system partition or any of partition. Download, install and run IM-Magic Partition Resizer Server. 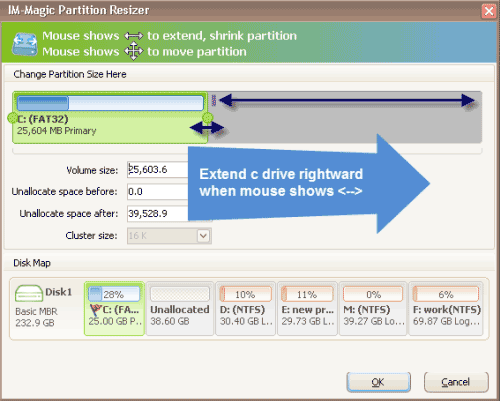 Then, right click a partition that has much free space and choose "Resize/Move". When mouse shows double arrows symbol, you can move the arrows to shrink the selected partition to squeeze some free space. The free space will show as unallocated volume. You need to move the unallocated volume close to the partition that runs on low disk space. Then, you can right click this partition and choose "Resize/Move" option. 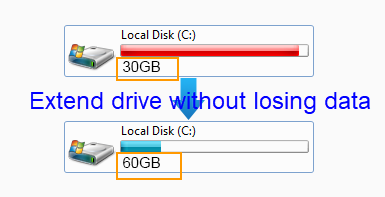 Move the arrows when mouse shows double arrows symbol to add the unallocated space to the selected partition. Then, you can click "Apply" button to get the partition extended. "The C drive has 20GB capacities, but now it only has about 1GB free space left. In order to protect my PC from running into any unexpected disaster, I want to extend the size of C drive. But the problem is that I don't know how to resize the C drive without reinstalling system or formatting the hard disk. I have never met such kind of problem before. Can anybody tell me how to increase size of C drive on Windows Server 2008 when it runs on low disk space?" "The system partition runs very low disk space on Windows Server 2008 in VMware. How can I fix the low disk space problem without reinstalling the virtual disk? I have tried to delete some old files and even uninstall several applications, but the problem still cannot be resolved. Is there any way that can repair low disk space on system partition in VMware on Windows Server 2008?" Deleting and moving files are the most common way to free up disk space when disk partition is running out of disk space. However, if you want to fix the low disk space problem thoroughly, the best way is to increase the size of the partition. On the one hand, deleting or moving files can only free up little disk space which will be occupied soon when new data is written to the partition. On the other hand, most files stored on C drive is important, so you cannot delete or move any file from C drive when it runs out of disk space. In this situation, you can use the IM-Magic Partition Resizer Server to move free space from other partition to expand C drive space. Why Use IM-Magic Partition Resizer Server? Do you know that Disk Management can help resize hard disk on Windows Server 2008? You just need to open Disk Management and select a partition that has enough free space and choose Shrink Volume to squeeze some unallocated space. Then, you can add the unallocated space to the partition that runs on low disk space. Disk Management works similarly as the partition software to resize hard disk, but the only problem is that Disk Management cannot move a partition. If the unallocated space is not right adjacent to the partition you want to extend, you cannot move the unallocated space to get the partition extended.